Had to share this new recipe we made this weekend. And this is why allrecipes.com is so great - the recipe is one thing, but the reviews and comments ("this was great, but here's how I completely changed it to make it better") really make the site worthwhile. While the original recipe has you simmering the chicken and seasoning for 20+ minutes, putting the goods in the crockpot in the morning made evening prep pretty darn easy. Of course, it also prevented us from staying out too long for happy hour on Friday after work - not sure if that is a bad thing or a good thing! Mix the onion, taco seasoning, onion powder, chili powder and garlic powder with a cup of water. Put seasoning mixture and chicken in crockpot - low for 8-10 hours. Shred chicken by placing two forks back to back and pulling meat apart. Meanwhile, combine the cream of chicken soup, sour cream in a saucepan. Bring to a simmer over low heat, stirring occasionally, then turn off the heat and cover to keep warm. Heat the butter in a skillet. Add shredded chicken, chopped green chilies, half of the bunch of chopped green onion, and water. Allow to simmer for 10 minutes. Stir in the lime juice. Preheat an oven to 350 degrees F. Stir 1 cup of the soup mixture into the skillet with the chicken mixture. Spread the remaining soup mixture on the bottom of a 9x13 inch baking dish. Fill each tortilla with chicken mixture. Sprinkle cheese over the chicken filling before folding the tortillas, reserving half of the shredded cheese for topping the enchiladas. Fold tortillas over the filling and place seam-side down in the prepared pan. Pour enchilada sauce evenly over the enchiladas. Cover with the remaining 1 1/2 cups of Cheddar cheese. Sprinkle the reserved chopped green onions and the sliced olives on top of the cheese. Bake in the preheated oven until filling is heated through and the cheese is melted and bubbling, about 25 minutes. For Bob's birthday weekend, I had to outdo my indoor camping trip adventure and a LOST weekend. We had originally been looking at planning a Europe trip this spring that needed to be postponed, but I figured I would bring the cities we were going to visit to the birthday boy instead! I split the apartment up into sections and decorated each area as needed to represent London, Paris, Amsterdam and Venice. 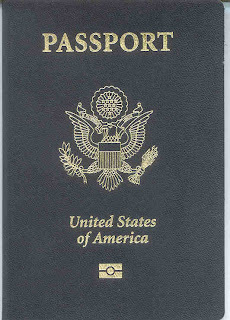 Note: a real trip to Europe is still an essential trip that needs to happen - there are still many places I haven't been and Bob is ever closer to sending in his passport application. I made a card with the US passport photo on the front and room for stamps on the inside. At each area of the house I left a stamp and inkpad that we would use to fill out his card as we moved along. After feeling guilty for kicking him out of the house for a few hours, I let him back in via the back door for the first stop: Our Master Bedroom a.k.a. Foggy London Town. I used our giant TV box from our new bedroom TV for the wall art including this Big Ben - let me tell you something, that cardboard is thick and the glossy outside of the box does not easily cut through. Was glad I set aside a full hour for the art projects! I painted it black and made a clock face and clouds. All of our British-based DVDs and English Literature (can I call Harry Potter "literature?) were also strewn about the room and The Clash was blaring from my iPod dock as we entered. Bob's gift was a messenger bag from the Gap, an Eddie Bauer umbrella and some toasty socks to get him through the travels. The second stop was Venice. Now, this was not actually on our list of cities to hit in our trip to Europe, but I couldn't resist turning the long hallway into a gondolier-led journey. Luckily, the sheets on our guest beds are blue (okay, a bit more gray and black than blue, so I pretended it was night!) so I laid them out the length of the hallway. The cats had a lot of fun with this while I waited for Bob to get home! Another TV box creation hung on the wall - a gondolier and our "ride". My laptop was hidden in the guest bathroom so I hit play as we started the walk so we could listen to an Italian Diva from the Sopranos soundtrack. Originally I thought I would need to buy some music off of iTunes for the various areas but once I started thinking about my collection I realized I had them covered. Next up was Amsterdam. While the mind could wander to some questionable activities in this area of the house, if you know me at all you know its clean living all the way. I focused on two of the Netherlands most notable outputs: tulips and van Gogh. This came with the promise to go the Art Institute sometime soon! 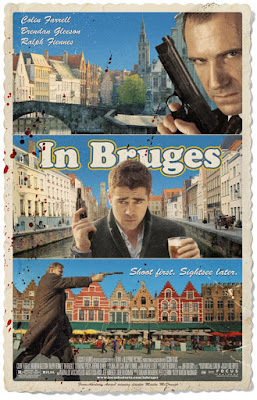 The next area was Belgium - at this point in the evening we were just flying over it, getting a sneak peek at what would come later on in the night: Stella Artois, Belgian chocolates and In Bruges! First up though was dinner - in this case, we headed to France. The counter was stacked with french books and movies and the soundtrack to 8 Women was playing through the TV. The world's worst drawing of the Eiffel Tower (although Bob argues it was accurate) accompanied the display. Attempting to make the table a bit more "Romantic French Bistro" I added a tablecloth (actually a sheet) and a small vase of roses (actually some nearly dead tulips that got darker and opened up more). Gougeres were first up - these were so incredibly easy and I had enough left over dough to stick in the fridge and bake up a couple days later. Preheat the oven to 400°. Line 2 baking sheets with parchment paper. In a medium saucepan, combine the water, milk, butter and salt and bring to a boil. Add the flour and stir it in with a wooden spoon until a smooth dough forms; stir over low heat until it dries out and pulls away from the pan, about 2 minutes. Scrape the dough into a bowl; let cool for 1 minute. Beat the eggs into the dough, 1 at a time, beating thoroughly between each one. Add the cheese and a pinch each of pepper and nutmeg. Transfer the dough to a pastry bag fitted with a 1/2-inch round tip and pipe tablespoon-size mounds onto the baking sheets, 2 inches apart. Sprinkle with cheese and bake for 22 minutes, or until puffed and golden brown. Serve hot, or let cool and refrigerate or freeze. Reheat in a 350° oven until piping hot. When making the choux pastry, it is important to be sure that each egg is fully incorporated into the batter before adding the next. Don’t worry if the batter separates and looks curdled at first. Keep beating, and it will come together nicely. Preheat oven to 400°F. Prepare Basic Vinaigrette. Toss greens with vinaigrette and divide evenly between 2 bowls. Lightly brush each side of each baguette slice with oil. Place on a baking sheet and bake for 3 to 5 minutes on each side or until lightly toasted. Top with cheese slices; return to oven and bake for another 5 minutes. Place a crouton on top of each salad and serve immediately. Basic Vinaigrette: Whisk together 1-1/2 tbsp. extra virgin olive oil, 2 tsp. red wine vinegar, 1/2 tsp. Dijon mustard and 1/8 tsp. sugar. Season to taste with salt and pepper. Bring a large pot of water to a boil. Meanwhile, break off the woody bottom sections of the asparagus and peel the spears up to the flower buds. Put the butter and oil in a skillet and turn the heat to medium-high. When the butter melts, add the mushrooms, shallots, and salt and pepper to taste and stir. Cook, stirring occasionally, until the mushrooms have given up their liquid and it has begun to evaporate, about 5 minutes. Add the cream and boil, stirring occasionally, until mostly evaporated, about 10 minutes. Meanwhile, salt the boiling water and blanch the asparagus for about 5 minutes, or until bright green and just about tender. Drain and keep warm.When the mushroom mixture is creamy but not soupy, stir in the sherry. Cook for another minute, then spoon over the asparagus. Garnish with the chives and serve. Finally, I was planning on making Steak au Poivre, but my limited access to stores prevented me from picking up Cognac in time. Instead, I cooked the steaks with pepper and salt on each side and used the Mushroom cream sauce for the steak as well. Uncork a nice French Red and Bon Appetit! It was a very nice evening and got us excited to eventually plan that real trip to EU together. The question is, what do I do for his birthday next year?? I love tickets. Doesn't matter what they are tickets for, I'm happy to receive them. There is just something about getting dressed up to go to a show courtesy of Broadway in Chicago, filling up the picnic basket and heading to an outdoor concert at Ravinia, spending a summer afternoon with the Cubs at Wrigley Field or even just catching a matinee at the AMC down the street. Confession of my Crazy Ways: I've kept every ticket in my photo album scrapbooks for as long as I can remember - let's just say the first one saved was The Rockateer! This past Christmas I was ticket bearer to three family members. My family went in on a gift my dad was sure to love: 2 tickets for the upcoming PGA Championship to be held at Whistling Straits in Kohler, Wisconsin this August. Since the PGA does not send the actual tickets so far in advance, I created a couple faux passes on the computer and wrapped them with an "article" I wrote about dear old dad joining the Senior Tour after an inspiring trip to the Kohler event. Can't wait to hear all about it - wonder if Tiger will make an appearance? My sister and I love when family members make the trip down to visit us. And if my adorable 9 month old niece isn't reason enough, I thought I'd sweeten the deal by promising my Aunt Christine an outing to an upcoming musical upon her next trip to Chicago. Billy Elliot starts in March - time to make it happen! Bob and I collaborated on a gift package for my sister and brother-in-law. That aforementioned niece? Sort of the reason they haven't been out to a movie since May 2009. The movie? Star Trek. Not even being 9 months pregnant would stop my sister from seeing that one - yeah, we're Trekkies and proud of it! We picked up a gift card for their closest movie theater and loaded it up for at least 3 movie trips. Well, 2 if they splurged on movie popcorn. Packaged with typical concessions fare of Milk Duds and Sour Patch Kids in a popcorn box, we also added a "movie poster" for The Babysitters starring Lydia and Bob and introducing little Ella. They recently took advantage of the Golf Mill Shopping Center Kerasotes in Niles amazing $4.50 matinee deal to see Up in the Air. Happy to report that Ella was an angel during my babysitting gig! Tip of the week: You can sign up for a Five Buck Movie Club for Kerasotes theaters to get discounts on 2-week old movies. Be sure to check out what offers your preferred theaters have - AMC MovieWatchers, etc - there is a rewards program for everything nowadays! I usually do all of my searching through Ticketmaster, but if I can purchase the tickets at a box office it is worth the walk. Amazing how many fees are associated with buying online, and when you are getting multiple tickets it can really add up! Other than the musical with my Aunt that we still need to nail down, I do not have any upcoming concerts or shows to look forward to. Time to check out who's coming to town! I’m all about the free on the internet – dinner plans courtesy of allrecipes.com, music from Pandora and photo sharing with Snapfish. So I was extremely happy when I landed on a free service I didn’t even know I needed until very recently! I just started taking an HTML class at my local city college (and by local I mean down the street from my house) as part of a Web Design certificate I am considering going for. While learning about style sheets, background jpgs and the like, I found myself thinking about how I can apply my new-found wisdom to a blog upgrade in the near future. My color scheme inspiration? A preppy purse I bought in Croatia. No sooner did I start to wonder how on earth I would be able to translate a purse into a blog than the teacher punched up kuler.adobe.com. Up went a photo of the purse, though I did make sure to carefully consider the background colors of the shot so there was not a rogue hot pink added to the mix. I ended up putting my bamboo plant in the background to see how green would blend in. And voila - I have my new theme, complete with the HEX coding for each of my lovely colors. The brainstorming for other design elements has begun! More information to come on The Big Blog Revamp, perhaps timing will coincide with my one-year blogiversary in May. . .feel free to email me with any suggestions! It's that time of year for grand gestures and declarations of love. 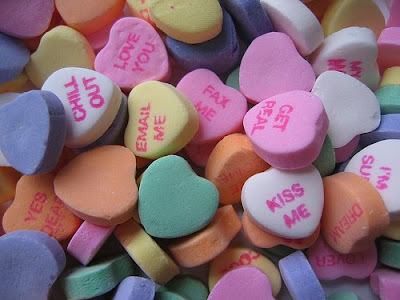 But mostly of candy hearts that say "fax me" even though it is not 1985 (although they sort of taste like they've been sitting around since 1985 don't they? ). photo source: flickr.com. Back during the "wooing" stage of our relationship, Bob came over to my studio apartment on Feb 14 armed with groceries and a bottle of vino. He had admitted he did not have much cooking experience so imagine my surprise when he pulled out a four-piece menu! All of the following can be found on allrecipes.com. In a small bowl, whisk together the sugar, olive oil, honey, vinegar and lemon juice. Set aside Place the salad greens in a serving bowl and top with avocado and strawberries. Drizzle dressing over and sprinkle with pecans. Refrigerate for up to 2 hours before serving or serve immediately. In a large bowl, stir together sugar and sherry. Add scallops to the bowl and marinate for 30 minutes. Remove the scallops from marinade and sprinkle with salt. Center a scallop piece, water chestnut and a scallion on a piece of bacon. Wrap and secure with a toothpick. Arrange on broiling pan. Place pan under broiler for 10 minutes, turning once until bacon is golden and cooked. In a large pot over medium-high heat, bring milk, water, and salt to a boil. Gradually whisk in polenta. Reduce heat to low, and cover. Cook 20 minutes, until creamy, lifting the lid and stirring every 3 or 4 minutes to prevent sticking. Remove pot from stove, stir in pepper and butter. Gradually stir in cheese. Serve. Sprinkle pepper over both sides of each steak, sprinkle with salt to taste. Heat a nonstick skillet over medium-high heat. Place steaks in hot plan and cook for 1 minute on each side or until browned. Reduce heat to medium low and add balsamic and red wine. Cover and cook for 4 minutes on each side, basting with sauce when you turn the meat over. Remove steaks to two warmed plates, spoon one Tb of glaze over each and serve immediately. Of course, presentation left something to be desired because I did not have a dining room table - something about sitting at the coffee table facing the same direction just doesn't scream "romantic dinner." Luckily, this year we have a table to our name. Oh, and I'm the one in charge of the home-cooked meal. Will it compare to this spread Bob made for me two years ago? Only time will tell. We decided to host a Super Bowl party. Not so much because I'm crazy about football or that my team even had a chance of making it, but because we like an excuse to have a dozen people over and eat a lot! Our recent Costco purchase doubled the action and there was no delay with our regular TV because they were both hooked into the same satellite box. This also meant we could switch to the internet feed during half time to watch Peyton Manning's United Way Ad on nbc.com - possibly my favorite SNL digital short. On to the food - the real stars of the show. Starting with the appetizers and leading into a sandwich spread, we were setting folks up for a full day of eating. Although I know it isn't what I should be spending the party budget on, we couldn't resist the plates and football napkins from Target shown in the header picture. Here's the starting line-up (how many football themed phrases will I be able to squeeze into this post?). Pre-made and easy to set out snacks like pretzels, a veggie tray and Lipton onion dip were overshadowed by a few new undertakings. Per usual, I relied on allrecipes.com to point me in the right direction. Add to these a bowl of shrimp with cocktail sauce one of the guests brought and our little dining room table was close to toppling over. These Bacon Tomato Cups turned out pretty well, I doubled the recipe but should have put even less mayo in than the reduction I already made based on allrecipes.com comments. Between the bacon, biscuit dough and cheese, the added mayo makes these way too greasy to be good. Preheat oven to 375 degrees F (190 degrees C). Lightly grease a mini muffin pan. In a skillet over medium heat, cook bacon until evenly brown. Drain on paper towels. Crumble bacon into a medium mixing bowl, and mix with tomato, onion, Swiss cheese, mayonnaise and basil. Separate biscuits into quarters. Place each piece into cups of the prepared mini muffin pan. Fill each biscuit piece with the bacon mixture.Bake for 10 to 12 minutes in the preheated oven , or until golden brown. Our cheese plate was pretty simple this time around - one big ole block of Bondost. Bondost is a Swedish farmer's cheese spiced with caraway seeds and is a table fixture at Bob's family's get-togethers. Speaking of cheese, this next one is a little cheeseball, and I mean that literally. Mine was not as dark as some of the pictures on allrecipes.com, but all the comments pointed to less taco seasoning so I settled for a lighter color. Mix together the cream cheese, shredded Cheddar, green onion, Worcestershire sauce, and taco seasoning mix in a large bowl. Press the cheese mixture into a ball, turn it out onto a sheet of plastic wrap. Use the plastic wrap to press the cheese ball into the shape of a football by flattening the ball and rounding each end. Place the cheese football on a plate, arrange strips of American cheese like laces on the top of the cheese football. Cover and refrigerate for at least 2 hours. Remove the cheese ball from the refrigerator 30 minutes before serving. Finally, Bob's Big Project was the Wings! Using Guy Fieri sauce recipes and a 40 pack of wings, he got to work, starting the day before with baking the wings. Preheat the oven to 350°F Season the wings with salt and pepper and arrange on a baking sheet in a single layer. Cook until just brown and crisp, about 45 minutes. With sauces including Tequila-Lime, BBQ and Hot Sauce at the ready, he grilled the wings for about 10-15 minutes during the party before drenching them in the marinades. This tray that I got for Christmas from my sister and brother-in-law worked out perfectly to display them. Although we did not need them for this spread, I love how the smaller tray has toothpick holders! Don't you just want to take a big bite of celery drenched in blue cheese? Drink-wise, We couldn't pass up the Heineken Mini Keg, set out with our brewery themed pint glasses. We found the perfect pour was elusive though - foam central! Good thing we had plenty more choices in the fridge: everything from Miller Lite to Stella to 2 Below. At halftime, we set out Round 2. Along with my Mom's pulled pork kept warm in a crockpot, we set out deli meats, cheese, lettuce and tomato in case folks wanted a lighter sandwich. A side of tasty coleslaw and King's Hawaiian Sandwich Rolls made the meal. Combine all rub ingredients in large resealable plastic bag. Trim excess skin and fat from pork leaving a 1/8 inch thick layer of fat. Place meat in bag with rub. Seal and toss to coat meat. Refrigerate overnight. Make BBQ sauce by heating oil in 3 qt. sauce pan over medium heat; add onions and cook 4-5 minutes until softened. Add remaining ingredients; bring to a boil. Reduce heat and simmer 30 minutes until slightly thickened. Makes 2 cups. Heat oven to 325. Arrange roast in 9x13 pan; pour sauce over top. tightly cover pan with foil. Bake 3.5-4 hours until tender. Pull meat off of bone with a fork, discard bone. Return pork to pan with sauce and bake uncovered 25 minutes more. Serve on bread slices or buns. Room for Dessert? 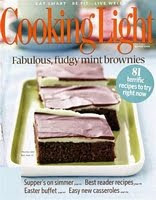 I made a batch of Chocolate Mint Bars from Cooking Light. Better results than last time when my green food coloring jar leaked and I turned into the Wicked Witch of the West/Shrek for a few hours. As if 20 chocolate bars weren't enough, our lovely guests contributed even more! We all nearly fell over after trying this Tiramisu Layer Cake from allrecipes.com. Preheat oven to 350 degrees F (175 degrees C). Grease and flour 3 (9 inch) pans. Prepare the cake mix according to package directions. Divide two thirds of batter between 2 pans. Stir instant coffee into remaining batter; pour into remaining pan. Bake in the preheated oven for 20 to 25 minutes, or until a toothpick inserted into the center of the cake comes out clean. Let cool in pan for 10 minutes, then turn out onto a wire rack and cool completely. In a measuring cup, combine brewed coffee and 1 tablespoon coffee liqueur; set aside. To make the filling: In a small bowl, using an electric mixer set on low speed, combine mascarpone, 1/2 cup confectioners' sugar and 2 tablespoons coffee liqueur; beat just until smooth. Cover with plastic wrap and refrigerate. To make the frosting: In a medium bowl, using an electric mixer set on medium-high speed, beat the cream, 1/4 cup confectioners' sugar and 2 tablespoons coffee liqueur until stiff. Fold 1/2 cup of cream mixture into filling mixture. Whew. That's a lot of recipes. Thinking ahead to posts on a Valentine's Day Flashback and A Ribs Recap, I think its about time to update the Index so all of the good stuff is easier to find! I am very excited to offer the first giveaway on the blog! 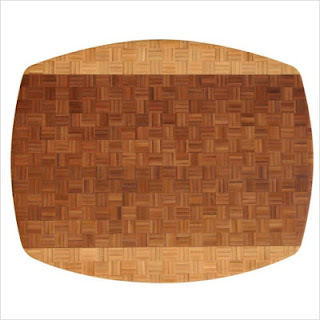 The good folks at Cookware.com are offering up this Totally Bamboo African Congo Cutting Board to one lucky reader. Besides having hands down the best name for a cutting board I've ever read, the distinct look and good size of the board should make your dinner prep just a little more enjoyable. Also, it is hard to beat the comment in one of the reviews: "it's like cutting on butter." This original, stylish board was designed for extensive use and size in mind. Featuring their elegant parquet end grain, exclusive to Totally Bamboo, the African Collection offers a unique aesthetic appearance while maintaining a high quality cutting surface. Aptly named, the Congo is a full sized board that gives you a broad cutting surface for any and all kitchen tasks. I have spent a good part of the weekend poring over the goodies on the site. 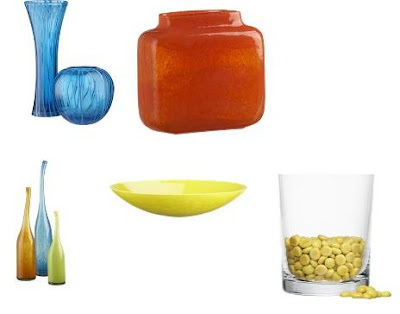 Hmm. . .I could use a CucinaPro ravioli tray, Le Creuset sangria pitcher, Warhol-inspired dishes, 18-piece Pyrex storage set. . . and then of course there are CSN Stores' plethora of other sites: in the market for a new bar stool set? They've got you covered. - Comment on this post, be sure to include your name to be eligible! - Answer This: What are you going to be chopping on YOUR new cutting board? Avocado and tomato for a homemade salsa? Veggies for your patented stir fry? Share the love and link to recipes if available! I will pick a winner using random.org early next week and post results by Wednesday, February 17. I will notify the winner via email to receive their shipping address. Yes, it's just that simple! We lucked out with our apartment having ample storage solutions. Between the coat closet, our bedroom closet, a basement storage unit and - shown above - a guest bedroom closet that is the length of one wall, we actually found places to house all of the stuff Bob and I had once we combined households! 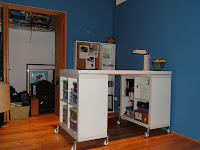 Of course, sometimes having the extra room makes it easy to keep filling up the space and forgo organization! The guest bedroom closet was split up into sections: games on the top shelf, left side; camping gear on the top shelf, right side. Holiday decorations on the lower shelf, right side; sports stuff on the lower shelf, center and craft supplies on the lower shelf, left side. Floor level includes frequently used suitcases, wall art and frames not being used right now, extra lamps (we have so many lamps!) and bins of my CDs. The CD situation is not ideal, but I am torn between getting rid of all the cases and finding a better solution. My sister has an ELFA storage unit from The Container Store attached to the back of a closet door housing all of her CDs but our closet doors do not shut if something is hanging over the top. Learned that the hard way with my old coat hanger! If you are like me, your eyes are drawn to the Craft Supplies area of this closet. I was starting to accumulate more card making and project goodies than I had room for and when we added Bob's architecture arsenal (including a seemingly endless supply of fine tip markers), we decided to invest in some more drawer space. 6 medium sized drawers were picked up at The Container Store for $7 each. Using a label maker, each drawer has its assignment: pens, stamp pads, paint, cards, etc. I took the labeling a step further and added labels to some of the other storage boxes on the shelf including rubber stamps, blank notecards, tissue paper and scrapbook paper. I invested in accordion filers for things like stickers, scrapbook paper and things that could be organized by occasion. I'm using smaller boxes to organize wrapping accessories like ribbon, bows and lots o' tissue paper. I don't like to save wrapping paper as I'm opening gifts, but will almost always set aside the tissue paper inside - not sure if I've ever actually paid for it myself! Wrapping paper is housed in the tall plastic bin in front of the closet - wish the shelf was just a tad higher so the wrapping paper bin would fit underneath. The guest bedroom closet is pretty much a done deal, but I can't help but have a nagging feeling that I forgot about something. Oh yeah! There's no room for an actual guest to hang their clothes up. Luckily, I was able to organize the basement storage unit enough to move the holiday decorations out of the way until they are needed next fall! But here's what we started with. Oh dear. The unit is about 4 feet wide and 5 feet deep, and a good 7 or 8 feet tall. So while space wasn't a problem, how we were using it was. Everything from paint cans and extra tile to our empty moving boxes to golf clubs to a chair we are holding for Bob's mom were piled on top of each other in no particular order. We decided to take advantage of the height factor by adding a tall shelf against the back wall. After the success of the plastic storage unit we had put in the back room of my parents' kitchen, I decided to get a similar unit for us. The 5 shelf unit was $39 at The Home Depot and fit in perfectly. Our flattened moving boxes - we saved just a few of the good ones - are wedged on one side helping to hold the shelf securely in place. The bottom shelves hold boxes of extra wine glasses and a china set Bob inherited that just don't fit in our kitchen. Moving up, you can see the holiday totes that had previously taken up closet space upstairs. The top shelf, filled all the way to the ceiling, has empty boxes. The same can be said about the top shelf of our coat closet. Why so many empty boxes? It makes moving so easy when you have original packaging for fragile or unwieldy items. I figure as long as we have the room, no sense getting rid of them just yet. As I'm writing this, though, I'm staring at the ginormous box our 40" flat screen came in. . .I don't think this thing is going to make the cut! Of course, the front of the storage unit still needed to house the chair and golf clubs along with some additional luggage. It was tight, but it all fit in just perfectly. If I am this excited about having a storage unit, how crazy is it going to be one day when I have a house with room after room plus basement, garage, den. . .movie theater?